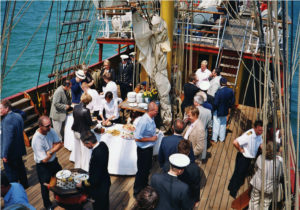 Tall ships lend an interesting dynamic to corporate entertainment. For one, it’s a unique experience. Your guests may visit with the captain, who has probably sailed extensively throughout the Great Lakes, east coast, and possibly the world. Kenosha Tall Ships® 2019 has several opportunities for you to “rent the deck” of a visiting ship on Saturday, August 3rd. You can also charter a ship during the day or enjoy a twilight sail. Capacities vary from 49 – 100 people on board, with the opportunity to expand dockside. For more information, contact: Kris Kochman at KKochman@kenosha.org. Packages may include exclusive opportunities such as lighthouse tours.